Directed with heart, humor, and a careful element of sophisticated cool, Edge of Tomorrow shines on the big screen. The problem with mind-bending sci-fi thrillers is that too often they're not mind-bending at all. Scores of movies have tried to match the narrative complexity and excitement of films like Inception, The Matrix, or (if it's okay to dip into indie drama territory) Eternal Sunshine of the Spotless Mind, only to dabble in the boring and pretentious. 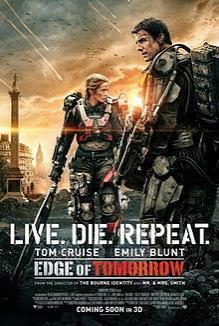 It's understandable that a lot of film fans had a certain amount of skepticism for Doug Liman's Edge of Tomorrow, which, like so many before it, attempts to put a new spin on the sci-fi genre with a narrative switchup. The idea here is a time loop (think Groundhog Day), in which the same day, or period of time, occurs repeatedly in succession. It's the type of concept that requires high-degree execution, and writers Christopher McQuarrie, John-Henry Butterworth and Jez Butterworth (working from Hiroshi Sakurazaka's novel All You Need is Kill) in collaboration with James Herbert, work wonders with the concept, injecting it with the intelligence, excitement, and heart that sets admirable sci-fi action apart from, say, Michael Bay. At the center of the time loop is Major William Cage (Tom Cruise), an untrained, inexperienced officer thrown unwillingly into combat with an intelligent alien race known as "Mimics." After being ordered unceremoniously to combat, he wakes up to find himself on a military base, with no idea how he came to be there. Cage is understandably scared out of his wits, especially given the facts that he doesn't know how to operate the high-tech super-soldier uniforms handed out by the army and that nobody seems to care whether he lives or dies. Upon their landing on the French Coast, it's clear to the members of Cage's squad that it's a suicide mission, as Mimic forces have anticipated their attack. Just as Cage learns the ins and outs of his highly complex uniform, he's killed by a Mimic's toxic blood (the blood comes as a result of his killing it). Cage awakes once again on the grounds of the military base, panickedly trying to explain his situation to higher officers and the members of his squad. They don't buy his story, and he once again lands in battle and dies shortly. The process repeats a few times before William recognizes that he's fighting with none other than Rita Vrataski (Emily Blunt), a decorated military icon and figurehead known for her countless Mimic kills. William desperately explains his situation to Rita, and she fortunately understands, advising him to "find her when he wakes up." Cage and Vrataski become unlikely allies, straying from military authority in each of Cage's lives, gaining more skill and knowledge of Mimic forces with each loop. To say anymore regarding the film's plot would only detract from the spectacular narrative and directorial work at hand. While Edge's time-loop concept sometimes sinks into tedium, it possesses an authenticity that defies pretense, making the at times confusing concept one of intrigue, rather than a laughable barrage of half-hearted "wait, what?" twists. Director Doug Liman (The Bourne Identity, Mr. and Mrs. Smith) directs with heart, humor, and a careful element of sophisticated cool. Blunt and Cruise perform terrifically, capturing the fear, confusion, and innocence of their characters and their unlikely relationship. It's an onscreen partnership that doesn't sell itself to phony romance but subtly depicts the dehumanizing effects of war on the human heart. Edge of Tomorrow unfortunately dies off toward the end, which is one of the only setbacks of an otherwise thrillingly executed story. And don't mistake it for a groundbreaking sci-fi classic. It isn't a great film, but it's a film that for the most part knows what it can and can't do, and ambitiously strives to do all it can, while occasionally crossing into territory that renders it unable to hold its own ambition (as mentioned before, the film seems to be on its second wind by the time it reaches it's close). It's no landmark, but Edge of Tomorrow is a film that will likely hold it's own throughout the summer, and it's one of the year's best wide-releases thus far. It offers a new, if not revolutionary take on the sci-fi blockbuster, and doesn't settle for anything less than honest, non-contrived filmmaking. For that, it's a breath of fresh air. Eric Kisner can be contacted at eKisner@ErieReader.com.